Marie LeBaron is the editor of Make and Takes, a popular parenting site featuring kids’ crafts, home projects, recipes, parenting tips and more. She lives in Seattle with her family, and loves to travel. It’s important to make a family plan before you get to the hotel and the park. Disneyland is a big place and you can make the most out of it by making a list of what’s most important to each person in your family. Set the expectation that you might not get to everything, but that each person will get to do 1-2 things on their list. Disneyland Fast Passes can help with this. They are available for most of the big rides and will help cut down on lines and give you more time. Be sure to grab one for each rider; they are worth it. Ready to plan your trip? Fly to Disneyland. Alaska Airlines has four airplanes that are decked out Disney. We flew on the “Adventure of Disneyland Resort” airplane, featuring beloved characters from the movie Cars, on our way down to Disneyland. While there’s no way to guarantee the airplane you’ll be flying on, keep your eyes peeled – the four planes fly throughout Alaska’s network and have been spotted on the East Coast, in the Hawaiian Islands and many points in between. Alaska also offers Disney-themed picnic packs and activity books for kids on all flights, so you can start your Disneyland vacation right away. On our way home, we flew on the “Magic of Disneyland” airplane, featuring Tinker Bell and a healthy dose of shimmering pixie dust, to round out the trip. It was my daughter’s favorite plane! There are several Disney-related smartphone apps you can download and play with in advance to get you excited for the trip. The official Disneyland app is free and is a great resource. It provides ride and character wait times, as well as dining and restroom locations. We also love to find hidden Mickeys (an image of Mickey Mouse concealed within the design of a ride or attraction in a Disney theme park) around the park while we’re in line for rides. Check out the Hidden Mickeys app for more fun ($5.99). 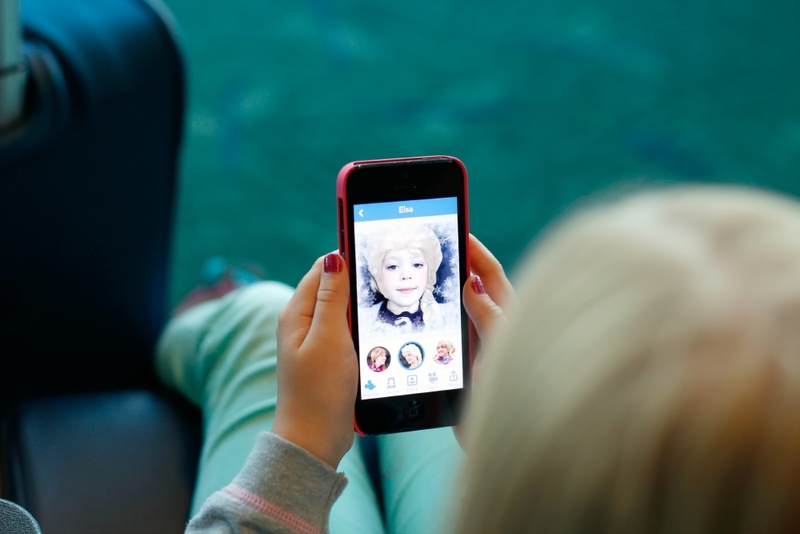 We also downloaded the Show Your Disney Side app, which is free and allows you to become one of the characters. This was a great game to play while we were at the airport, waiting to board our flight. 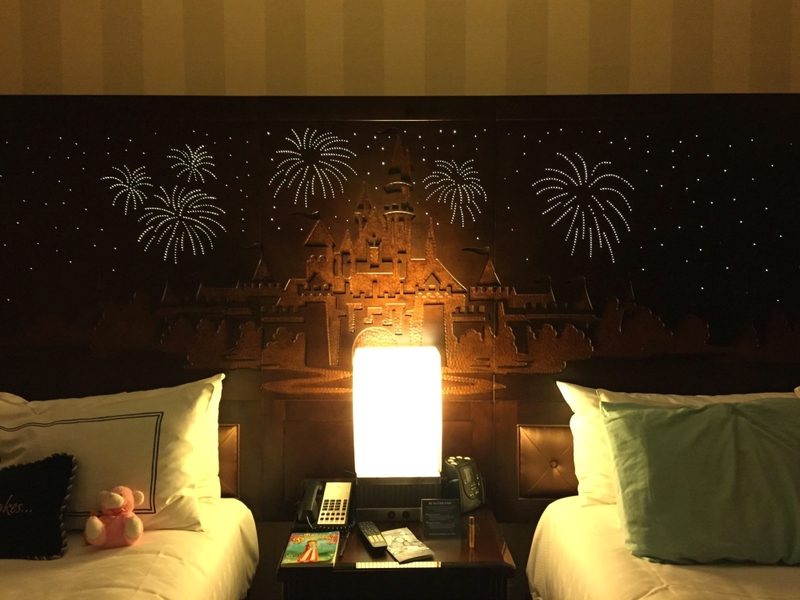 If you stay at one of the three Disneyland Resort hotels (Disney’s Paradise Pier Hotel, Disneyland Hotel or Disney’s Grand Californian Hotel & Spa), you can be sure Disney will go all out to make sure your visit is magical. The Disneyland hotel has recently been renovated and they’ve placed a few twinkling touches in each room. It just adds that little extra magic to the trip. Registered Disneyland Resort Hotel guests also enjoy early park admission with Disney’s Extra Magic Hour. If you have children under the age of 8, a stroller will be a lifesaver. Bring yours, or rent one from the park when you arrive. This will save your back from having to hold your tired child at the end of the day. You’ll also want to bring along a set of matching shirts to wear to easily find one another throughout the park. Be sure to have a small backpack with you, carrying sun block, a refillable water bottle and a camera. A backpack is also handy to have if you go shopping or if you need to remove your hat for one of the faster rides. It’s hard not to want to “go, go, go” while at the park, as you want to fit it all in. But plan to make a few stops, breaks, or naps throughout your day. If you’re staying at one of the park’s hotels, you are close enough to stop any time. Swim in the pool or take a nap with your little ones so you can stay up late and make it to the fireworks at night! These dining experiences are so much fun and worth the money. You get to see 5-6 of the Disneyland characters right at your table. We love to eat at Ariel’s Grotto so we can see all the princesses in one place without having to wait in any lines! You will be walking all over the place while at Disneyland. There are options for catching a ride along the way, like the train, trolley or monorail, but you’ll mostly be walking or standing in a line. Be sure to bring your best set of running or walking shoes for comfort if you’re planning to be in the park for a few days. While you’re walking quite a bit, use a smartphone app to track your step. On a half-day at Disneyland, we tracked 18,000 steps. On a full day at Disneyland, we tracked 25,000 steps (more than 12 miles)– phew! This is such a fun tradition at Disneyland, especially with kids. You can collect pins and trade them with other Disney-goers or with Disneyland employees. Some pins can be a bit pricey, so if you really want to get into trading, buy a set online before you go and trade them for ones you really want from different kiosks and employees around the park. If your little ones can stay up (taking that mid-day break really helps), you must catch the parade and fireworks. There’s really not a bad place to stop and watch the Paint the Night Parade, but we loved our spots near the “It’s a Small World” ride. 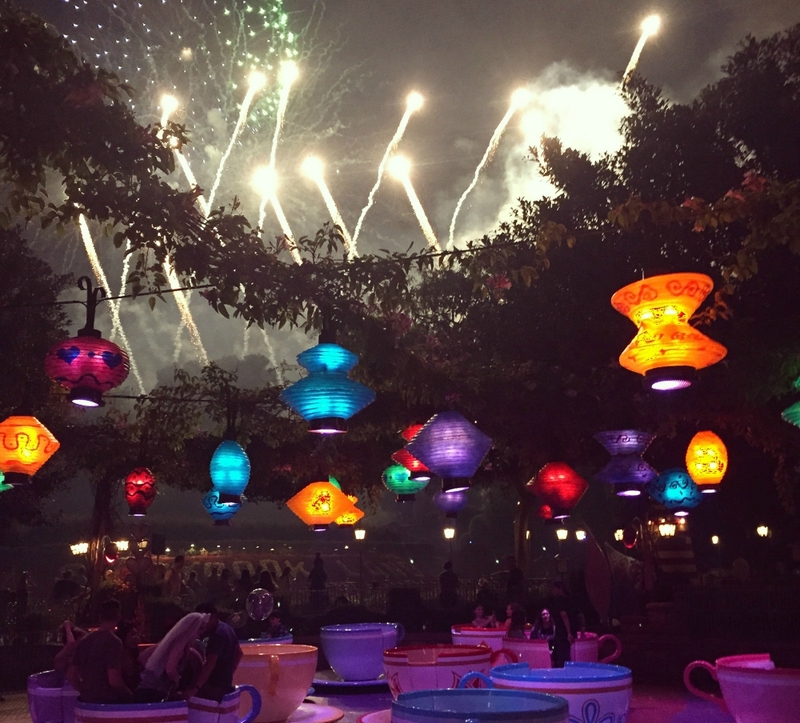 Afterward you can stick to your spot from the parade or hop on a nearby ride for a fun view of the fireworks show. You don’t want to miss Disneyland’s Diamond Celebration, which kicked off in March and runs until Sept. 5, 2016 in honor of the park’s 60th anniversary. Find deals on flights and vacation packages at alaskaair.com. 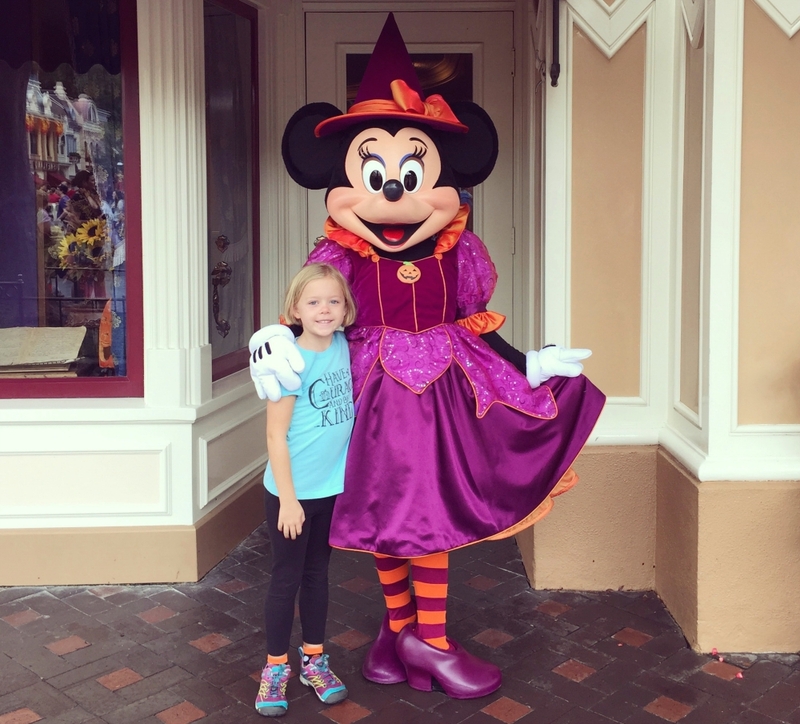 3 comments on "10 Disneyland tips for family-friendly travel"
Why are you still pushing a 2016 attraction? Thanks, Bobette! Have fun planning your Disneyland vacation! !